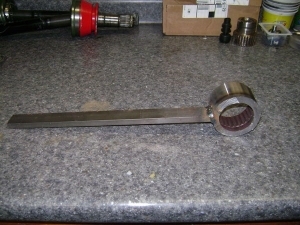 Homemade spline wrench adapted from the splined section of a surplus torque tube and utilizing a welded steel bar as a handle. I'm considering the practicality of destroying a torque tube to make a tool to rebuild a torque tube. I guess you had to be there.